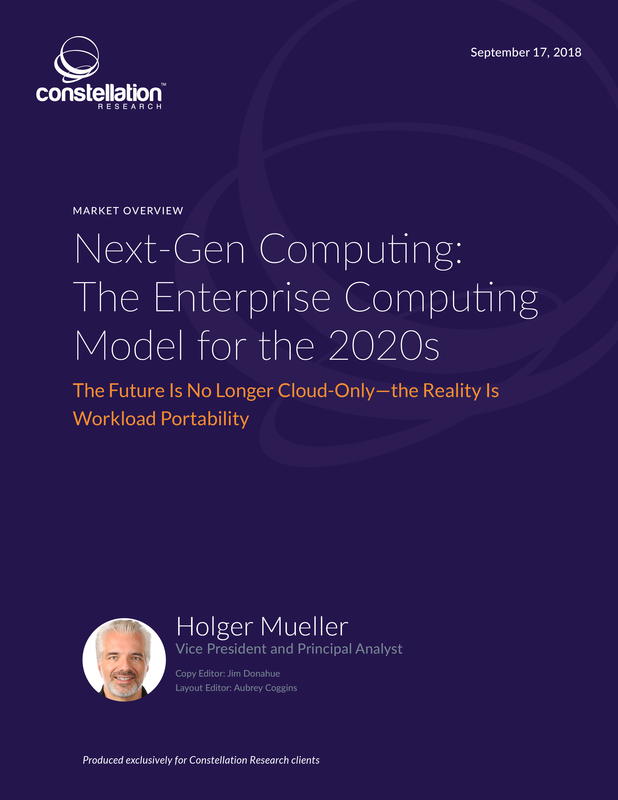 Next-Gen Computing: The Enterprise Computing Model for the 2020s | Constellation Research Inc. This Market Overview describes Next Generation Computing, a new computing paradigm for the enterprise that frees enterprises from workload lock-in, whether on-premises or in the cloud. Apart from an emphasis on workload portability, it postulates that enterprises benefit from a single pane of glass, and vendors need to provide service offerings accordingly. We also take a closer look at (in alphabetical order) Amazon Web Services Greengrass and Snowball Edge, Google Kubernetes Engine (on-premises version), IBM Cloud Private, Microsoft Azure Stack and the Oracle Cloud at Customer portfolio (this includes Oracle Exadata Cloud at Customer, Oracle Big Data Cloud at Customer, Oracle SaaS at Customer and Oracle Cloud at Customer). The report concludes with a set of tangible recommendations for CXOs, most prominently asking CXOs to realize the need to accept the new computing landscape and to embrace it sooner rather than later.